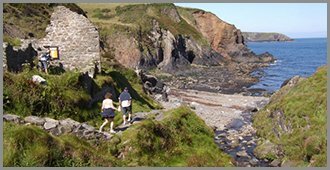 Are you a group of family and friends looking to escape for a few days break in a wonderful get-away-from-it-all location? Like to find somewhere to stay that’s perhaps just that bit special but that won’t break the bank? Need to make a group booking somewhere that would be a great place to celebrate a birthday or hold that long planned reunion? 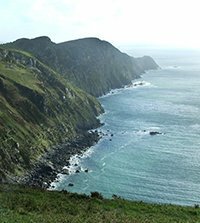 Perhaps you’re looking for a comfortable base for a walking group within easy reach of a world class national trail…or for a special interest holiday in an area that has inspired many an artist and is rich in wildlife and history. We’re afraid we don’t do stag or hens but if you’re looking for somewhere for your group booking that is away from the hurly-burly of the modern world for a while then The Old School Hostel may be just the place you are looking for. 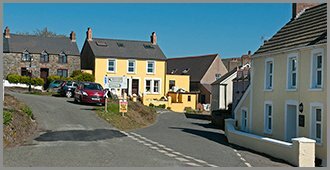 We’re situated in the attractive village of Trefin, a short walk from the famous Pembrokeshire Coast Path and only a 20 minute drive from the cathedral city of St. David’s. 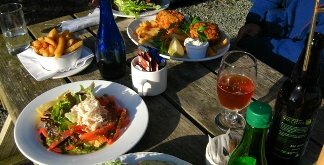 In the village there’s The Ship Inn which can cater for your group booking and The Mill cafe where James, the owner/chef, would be very happy to provide an evening meal exclusively for your group booking. The hostel itself has a well equipped kitchen if you’d like to prepare your own meals. 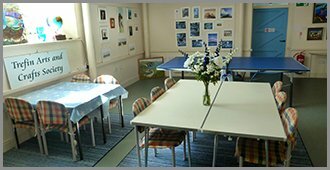 The ground floor of the hostel premises incorporates the village community room and group booking the hostel have used this for combined yoga and walking holidays, a venue for language lessons, nature talks and arts and crafts activities and for children’s birthday parties. It’s also a convenient space for larger groups to dine together and can be hired at a very low cost. Give us a call to discuss your group booking requirements and see our links page for contact details for the pub, café, children’s entertainers etc. How many can we sleep? There are 6 bedrooms in the main hostel building sleeping from 2 to 6 people. Three rooms have double beds and all rooms have en-suite showers. The bedrooms are superior to typical hostel accommodation as they feature top quality furnishings and décor, however they are quite small and storage facilities are limited. All rooms have en-suite showers. *Plus 2 people (1 couple) in our self contained en-suite studio room which has a standard size double. 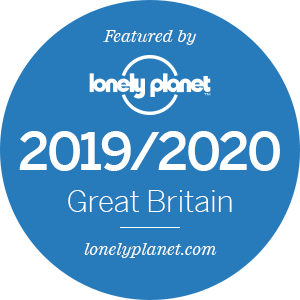 Our rates for larger groups are commensurate with bunkhouse type accommodation due to the space limitations in the bedrooms and communal facilities. Room 1: SLEEPS 2 in 1 x bunk bed with wash basin and en-suite shower. Room 2: SLEEPS 6 in 3 x bunk beds with wash basin and en-suite shower. 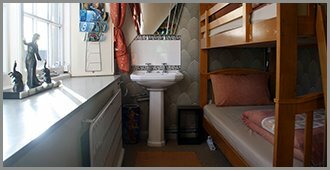 Room 3: SLEEPS 2 – 3 in 1 x bunk with standard size double on the lower berth with wash basin and en-suite shower. Room 5: SLEEPS 2 – 3 in 1 x bunk with standard size double on the lower berth and wash basin and en-suite shower. 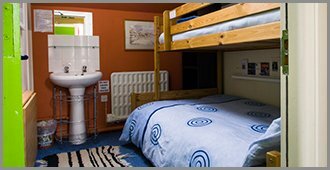 Room 6: SLEEPS 3 – 4 in 1 standard double bed and 1 x bunk bed with wash basin and en-suite shower. A further 2 people can be accommodated in our self contained studio room, Ty Popty which has a double bed and is separate from the main hostel premises. For details of Ty Popty’s facilities and prices see ‘Bedrooms and Prices/Self Contained Studio Room’. E.g. : 18 people = approx £16 each per night, 20 people = approx. £14 each per night. E.g. : 13 people = approx £20 each per night, 15 people = £17 each per night. E.g. 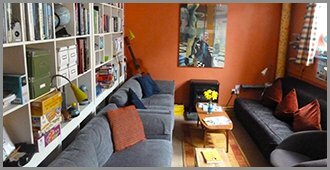 : 12 people = approx £20 each per night, 10 people = £24 each per night. Our minimum length of stay for exclusive use hostel bookings is 2 nights. 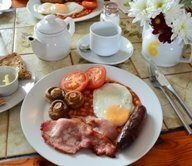 We offer a well equipped self-catering kitchen where you can prepare your own meals, or we can recommend The Mill Café in the village for a friendly waitress service and choice of cooked breakfasts. Self cater or be catered for – the choice is yours. Maybe you’d also like to order a packed lunch from the Mill Café, this includes a sandwich, a choice of fruit, a chocky bar and a choice of crisps and drink, all for just £7. 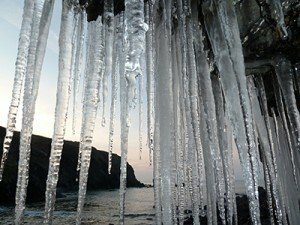 With wonderfully atmospheric Christmas services in St. David’s cathedral, some great winter walking to be had on the coast and a roaring fire in our local pub, Pembrokeshire is a special place to spend the festive season. We’ll supply the Christmas tree and decorations and ambience, you bring your family and friends. SPECIAL OFFER – Chris tmas from only £15 per person per night! At Christmas we offer a characterful budget alternative to an expensive larger holiday let. For a maximum group size of 10, allowing everyone ample room to spread out and unwrap all their pressies, the hostel is available on a self catering basis for the exclusive use of your party for only £250 per night! See below for the room layout. The minimum length of stay is 3 nights. *Please contact us for prices if your group is larger than 10 people. A popular venue for a group of families and friends over New Year, The Old School Hostel is available for your exclusive use from £230 per night with a minimum of 3 nights stay. One thing’s for sure, you won’t go hungry here in Trefin! This link takes you to our recommendations for cooked breakfasts, lunch and dinner options including our packed lunch menu. You’ll also find information on where to find the nearest supermarkets and speciality food shops. Also there are tips about which cafes we think serve the best coffee and where we’d go for that special meal out. Click here to find out more.